It is estimated that over 130,000 daycare businesses employ almost one million workers in the U.S. Most of these businesses have five or fewer employees, and many are sole proprietorships run out of the owner's home. 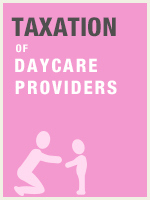 Many daycare providers are unaware of, or simply misapply, the somewhat confusing tax rules to which they are subject. This course guides the practitioner through the tax complexities, focusing on the proper determination of deductions, so that you may be better positioned to identify the issues and help your client minimize tax burden and the chance of noncompliance.